Ein Iahr ist 7 Days of Style nun alt - ein Jahr voller Outfits und Ideen. Ich bin sehr froh, Teil dieser tollen Mädchen zu sein, die alle ihren eigenen Stil in unsere Gruppe bringen. Mit Elan ins neue Jahr! 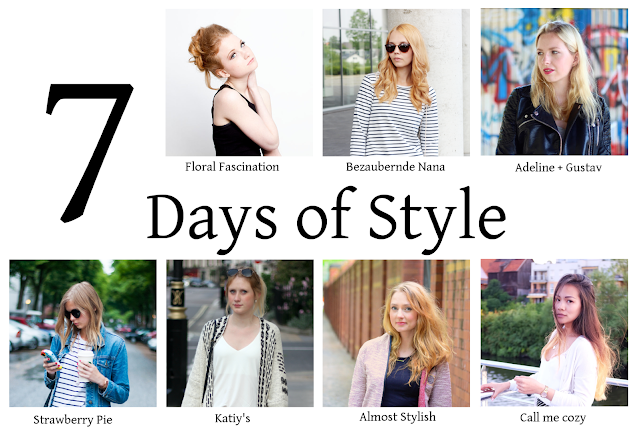 7 Days of Style turns one year this month - one year full of outfits and ideas. I am so happy to be part of these great girls who all bring their own style into our group. Here's to a new year! Bevor das neue Jahr anbricht, gehen wir es heute aber mal cosy an mit unseren Motto "Cosy Christmas". Zuhause trage ich oft Leggins und einen dicken Pullover. Ganz besonders mag ich dieses Pulloverkleid mit Kapuze und Bommeln - so wundervoll warm und kuschelig! Before the new year starts, we took it easy with our motto 'Cosy Christmas'. At home, I often wear leggins and a thick jumper. I particularly like this jumper dress with a hood and pompons - so wonderfully warm and cosy! Schaut auch bei den anderen vorbei! // Have a look at the others' cosy outfits! Perfect way to spend your day. das sieht nach einem wirklich kuscheligen und gemütlichen Outfit aus - nicht nur zur Weihnachtszeit! Und dazu noch zwei Kuschelkatzen - perfekt! Schöner Look - sieht echt klasse aus! Your style is always so creative! Love it! This looks like a perfect cozy holiday outfit! I would probably add my favorite fuzzy slippers, too. The perfect way to spend the weekend. Cozy and comfy. Happy Holidays, Kati. I love spending my time reading!